When I first read about Zipang, I can’t say that it was a title that greatly appealed to me; not only did it appear to be the latest in a long line of dull military stories set during the Second World War, but it also involved the overused and somewhat tiresome concept of people travelling back in time and trying desperately not to change the past. It hardly seemed like a concept that could last for three episodes, let alone twenty-six, but on the strength of some very positive recommendations, I decided to give it a try anyway. Thankfully, within the course of a few episodes, all my initial assumptions about Zipang had been proven to be incorrect. This was by no means a series that would run out of steam in its early stages- if anything, it needed far more than twenty six episodes in order to properly tell the story (as I later learned, this was no surprise, given that the original manga is at twenty-three volumes and counting). Despite the off-putting mix of WWII and time travel elements, the story is actually an increasingly absorbing one, charting the ripple effect of the Mirai’s appearance in the past. Unable to simply isolate themselves in the deep ocean, the crew must decide how best to interact with this era, but with each choice they make, inevitable consequences must follow- even saving the life of one man can have a drastic effect on the course of events. What really brings the story to life is the level of human drama contained in the series; admittedly, there are very few strong and memorable characters, but it is the cast as a whole that makes the series work. 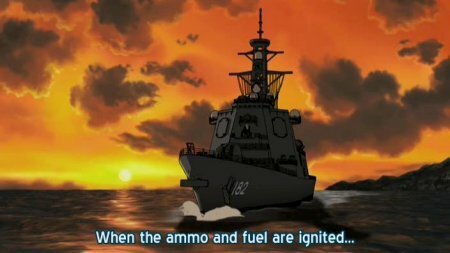 Unsurprisingly, centre stage is given to the crew of the Mirai, a group of Self Defence Force officers suddenly thrown into a bloody war where holding onto morals and principles is far more difficult than it would be in a time of peace. Unfortunately, the rather abrupt ending to the series doesn’t really give us any resolution to their stories, but it is nonetheless interesting to watch their evolution across these twenty-six episodes. Visually, Zipang sticks to a very realistic (some may even say drab) look, using subdued colour tones and a somewhat generic and limited range of character designs. Whilst this is indeed an appropriate choice for the series, it does mean that Zipang is not a particularly aesthetically pleasing anime, with only a very few scenes having anything significant in the way of visual impact. Background music is generally solid, although the opening and ending themes are eminently forgettable. Within a handful of episodes, Zipang was easily able to defy my expectations of a dull WWII rehash and prove itself to be an intriguing and well written series whose only flaw was ending too soon. Instead of struggling to reach the end, I found myself left wanting more- what a shame that the manga isn’t available in English[i]. [i] Yes, I know a scanlation group released about six chapters, but since the torrents are unseeded and the IRC channel is dead, I have no way of getting it. This entry was posted in Series reviews and tagged Kaiji Kawaguchi. Bookmark the permalink. Yeah, I gotta agree with you on that.